Install nginx on Rackspace Cloud Server with Centmin Mod Nginx Auto Installer easily. Here is text version of the process along with a guide video for nginx. nginx is a webserver software like Apache2. Actually we have another guide to Install nginx on Rackspace Cloud Server, that is the usual manual method. In this guide we are showing how to install nginx on Rackspace Cloud Server with Centmin Mod Nginx Auto Installer. You can read the guide how to Customize iTerm2 with Color Schemes, Syntax Highlighting etc. to get that effect. OS X 10.8 has been crazy, we have written how to ‘normalize’ it, the link is within the linked article. 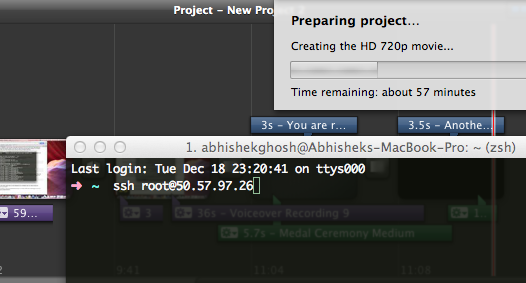 As you can see at time of writing, the video is actually being processed. As our visitors are global, not only from any specific country (US is our main source of traffic), I have tried to slow down the speech and tried to use a kind of universally understandable. So you got a kind of sneak peek of the ‘making of Install nginx on Rackspace Cloud Server with Centmin Mod Nginx Auto Installer video’. There is not much things to look or hear except few neighborhood street dogs are barking – they have surpassed the hardware and software level background noise reduction ! Coming back to work, basically the workflow is very easy. You have to login, change directory to local/src/ and wget the file. Unzip it (watch the video carefully), change directory to the new unzipped folder and run the script. As we had installed it before, we have show to update it, the basic method to Install nginx on Rackspace Cloud Server with Centmin Mod Nginx Auto Installer is the same – simple its a matter of selecting option, practically typing the number and hitting the Enter key. People avoided nginx for a big reason – its hard to configure than Apache2. nginx performs far better being light and this is a prepackaged drink with almost all the needed stuffs. This Article Has Been Shared 9235 Times! Cite this article as: Abhishek Ghosh, "Install nginx on Rackspace Cloud Server with Centmin Mod Nginx Auto Installer," in The Customize Windows, December 18, 2012, April 19, 2019, https://thecustomizewindows.com/2012/12/install-nginx-on-rackspace-cloud-server-with-centmin-mod-nginx-auto-installer/.